The Acorelle Organic Wild Rose Roll On Deodorant regulates perspiration by tightening the pores of the skin and provides a sensation of long lasting freshness. Enriched with natural alum stone with astringent properties, it fights against the bacteria responsible for bad odors. It is also composed of floral water of the known queen of the Meadows and oil of sweet almond for their soothing virtues on the epidermis. Thanks to its natural and soft formula, this deodorant care protects the skin of the underarms while providing an optimal comfort. Its roll on ball format allows you to carry it easily everywhere with you. Without alcohol, Acorelle Organic Wild Rose Roll On Deodorant releases a delicate pink and powdery fragrance. 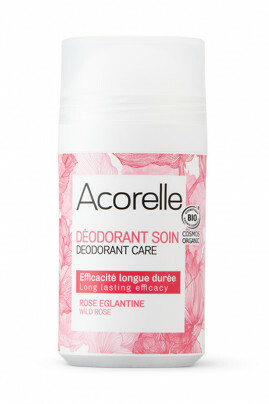 The Acorelle Organic Wild Rose Roll On Deodorant guarantees protection and comfort in everyday life! A deodorant care with organic composition! AQUA (WATER), POTASSIUM ALUM, SPIRAEA ULMARIA FLOWER WATER *, SACCHAROMYCES FERMENT, PRUNUS AMYGDALUS DULCIS (SWEET ALMOND) OLEOSOMES, XANTHAN GUM, ALOE BARBADENSIS LEAF JUICE POWDER *, GLYCERIN, PERFUME (FRAGRANCE), GLUCONOLACTONE, SODIUM BICARBONATE, BENZYL ALCOHOL , DEHYDROACETIC ACID, SODIUM BENZOATE, POTASSIUM SORBATE, GERANIOL, LINALOOL.